Join library experts and hundreds of your colleagues for interactive discussions on pressing issues in modern librarianship. 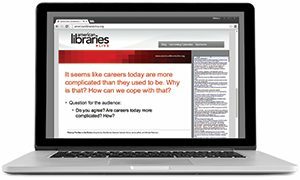 American Libraries Live webcasts cover the full spectrum of library topics and give the ALA community a chance to learn about and discuss issues it deals with daily. Each program lasts 60 minutes. Register for upcoming episodes of American Libraries Live at the links below. November 9: What Do the Midterms Mean for Your Library? September 14: What’s Next for RDA and the 3R Project? May 19: Social Media: What’s Next? 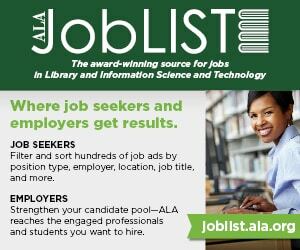 To discuss advertising in American Libraries Live, please contact Michael Stack, National Sales Manager, at 847-367-7120 or mstack@ala.org.